Fall brings with it the familiar and well-loved sight of woolly bear caterpillars crossing roadways and sidewalks. Looking like orange and black-banded bottle brushes, these 1-2 inch caterpillars dodge vehicles and bicycles to get to the other side. With luck and time, these beloved caterpillars will transform into Isabella Tiger Moths, a yellowish-brown moth not nearly as cute as its immature form. 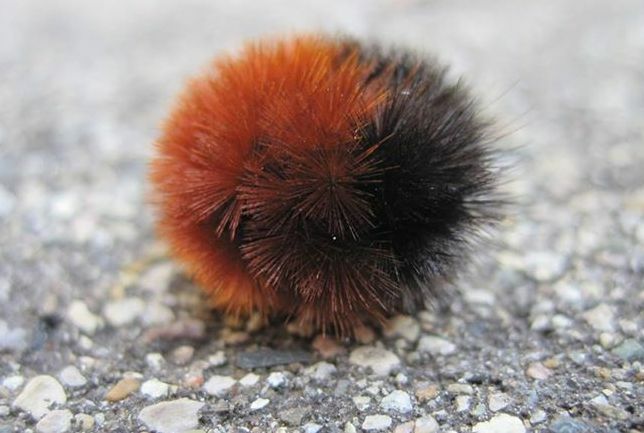 Woolly bears are one of the few caterpillars to overwinter as caterpillars, risking freezing temperatures and predation to emerge in the spring. Quite simply, woolly bears crossing roadways are risking life and legs to find the perfect leaf litter, the perfect board, or the perfect pile of wood chips under which to hibernate. They need a spot sheltered from drying winds, a bit of moisture, and cover from predators. When they find that spot, they curl up in a tight ball and settle in for a long winter. Their bristle hairs are a deterrent to predators (although raccoons have been observed brushing the hairs off and then eating these insect delicacies). The spiky ball shape makes the caterpillars slippery to predators. 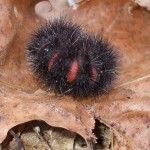 If you try to pick up a woolly bear in its hibernating pose, you may find it slips from your grasp. 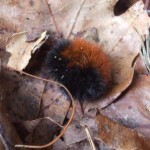 If a woolly bear survives a New England winter, it will emerge in the spring very hungry. At this time of year, you may see caterpillars wandering again as they search for food plants. The caterpillar eats for a short while and then spins a cocoon, made of bristle hairs held together with silk, in a protected spot under rocks or bark. In two weeks, an Isabella Tiger Moth emerges from the cocoon. The cycle begins again when the female Isabella Tiger Moth lays clusters of eggs on a variety of hostplants. Favorites include dandelion, grass, meadowsweet, nettle, and more. Eggs hatch in 4-5 days, and the young caterpillars feed in groups, becoming solitary as they grow older. Over 3-4 weeks, the caterpillars undergo 6 molts, or skin sheddings, and it is the second generation each summer that will cross roads to find that perfect overwintering spot. Woolly bears are very fast (for a caterpillar, at least). They can travel up to 4 feet per minute, which is roughly equivalent to .05 miles per hour. 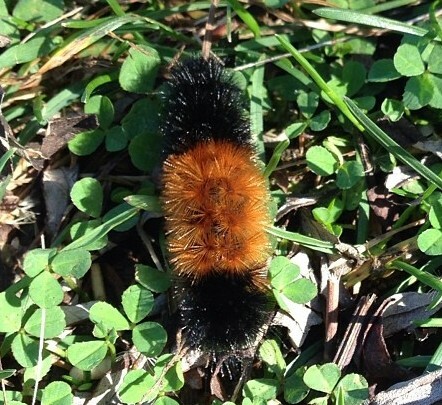 Contrary to folklore, the woolly bear is not an accurate weather forecaster. Does the width of its orange band predict the severity of the oncoming winter? No. Instead, each time the caterpillar sheds a skin, its orange band grows a bit larger. So, broader orange bands are most likely an indication of the age of the caterpillar, not of future winter weather. Banner Elk, North Carolina has been celebrating the Woolly Worm Festival since 1978. During the “Woolly Worm Race,” pet woolly bears race up a 3 foot long string. The winner becomes the official predictor of winter. This entry was posted in Nature Notes on November 12, 2014 by Kristin. What’s Hiding in Your Leaf Pile? Autumn leaf piles mean different things to different people. If you’re a child, leaf piles invite jumping and hiding and all sorts of fun. To many adults, all of those autumn leaves must be raked, blown, piled, chopped, dragged, or somehow transported to another place, anywhere that is not our lawn. This gorgeous caterpillar curls up in a ball when disturbed, revealing bright red bands in between black bands of bristles. 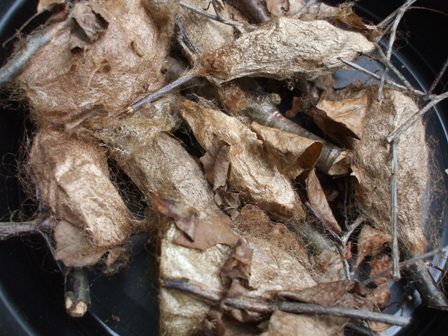 It hibernates in the same curled-up position under leaves, loose bark, and logs. Next summer, it will transform into a white moth with black spots, somewhat resembling a Dalmatian puppy. We frequently see this orange- and black-bristled caterpillar crossing roads in autumn to find a hibernation spot. 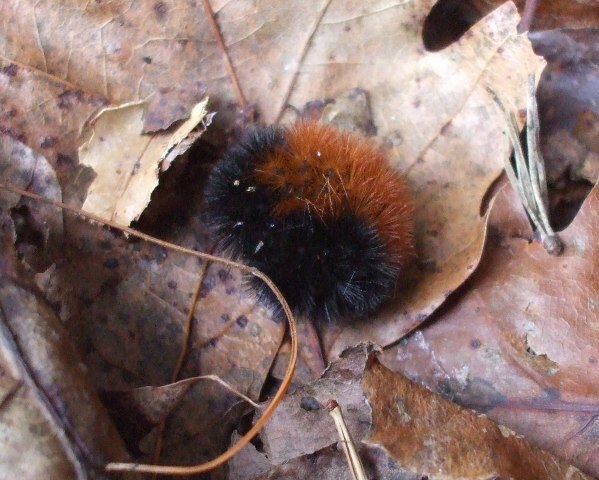 The woolly bear hibernates under leaf piles, logs, and rocks and will emerge in the spring to feed again before transforming into the brownish, less vibrant Isabella Tiger Moth. 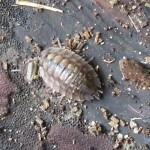 Sowbugs, which are crustaceans rather than insects, have 12 legs and 7 armored plates, reminiscent of ancient creatures. 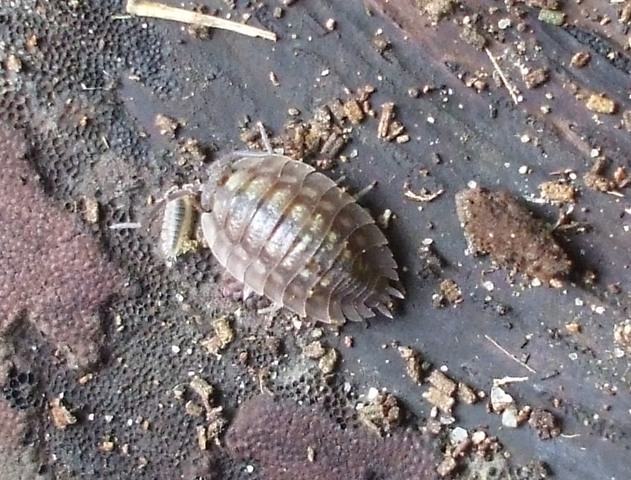 Sowbugs hide in damp places, like piles of leaves, and feed on decaying organic matter. Given enough time, sowbugs will eventually convert your leaf pile back into soil. What can we do to protect these fascinating creatures? Here are some steps to encourage creatures like those pictured above. You may not find all the ideas practical, desirable, or applicable to your situation and that’s fine. Use what works for you. Rake as few leaves as possible. In my yard, I only rake a central grassy area, leaving leaf litter in the flower beds and yard edges. Sure, it’s not as attractive as mulch, but it works to keep down weeds and it provides habitat for cool creatures. Be gentle. If I find a hibernating creature while I’m raking, I move it to a protected spot in a leafy area of my flower beds. For any creatures I’ve missed, I gently rake leaves onto a sheet and deposit them in a nearby wooded area, hoping they’ll emerge in the spring unharmed. 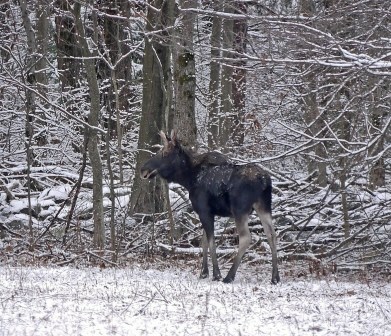 By Kristin Steinmetz, teacher naturalist at Broad Meadow Brook Wildlife Sanctuary in Worcester. This entry was posted in Nature Notes on October 9, 2013 by Kristin. If you’re under the impression that moths are dull creatures who eat holes in sweaters, you haven’t encountered a giant silk moth. Luna moths, Promethea moths, Polyphemous moths, and Cecropia moths are all native silk moths of the subfamily Saturniinae. These amazingly large, stunningly beautiful moths are found throughout Massachusetts, but we rarely see them. Flying mostly at night and spending much of their lives as caterpillars and cocoons, these moths fly under the radar. Observing one in action is always a WOW experience. In late May and early June, adult Cecropia moths (pictured above) emerge from their cocoons. With a wingspan of 5 to 6 inches, the Cecropia moth is the largest moth in North America. Adults are born without mouth parts, do not feed, and have one job: to mate and reproduce. Males have large feathery antenna, which can pick up the scent of a female from a mile away. 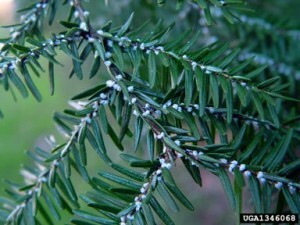 After mating, females lay more than a hundred eggs, usually in small rows on the underside of leaves. 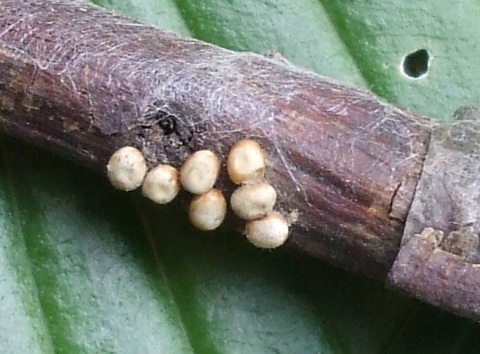 Around 10 to 14 days later, tiny black caterpillars emerge. The caterpillars are eating machines and feed on the leaves of many common trees including cherry (a favorite), sassafras, lilac, ash, apple, poplar, and willow. 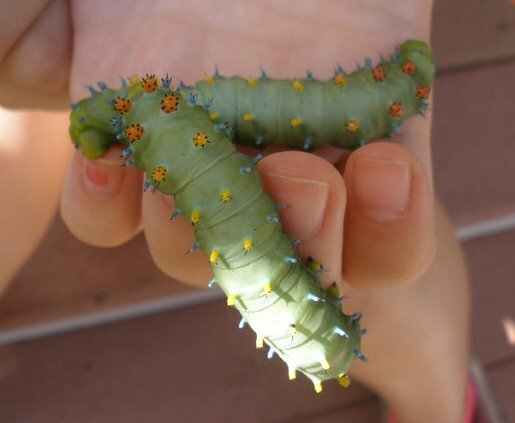 The caterpillars go through 5 instars (i.e., skin sheddings), and grow very large. By the 5th instar they’re often at least 4 inches long and thicker than an adult thumb. They are also remarkable looking, with a frosted green coloring and red, blue, and yellow knobs extending from their bodies. Children often remark that it looks like ladybugs are riding on the caterpillar’s heads! The caterpillars have many enemies and mortality rates are high. After weeks of eating and growing, the rare caterpillar that has successfully reached the 5th instar is ready to cocoon. On a branch or twig, the caterpillar will spin a rough, brown, spindle-shaped cocoon. The caterpillar will spend the winter in the cocoon, transforming into an adult moth, ready to emerge in late spring. Sadly, Cecropia moth numbers appear to be in decline due to habitat loss, pesticide use, and parasitism by a tachinid fly introduced to control the Gypsy Moth. 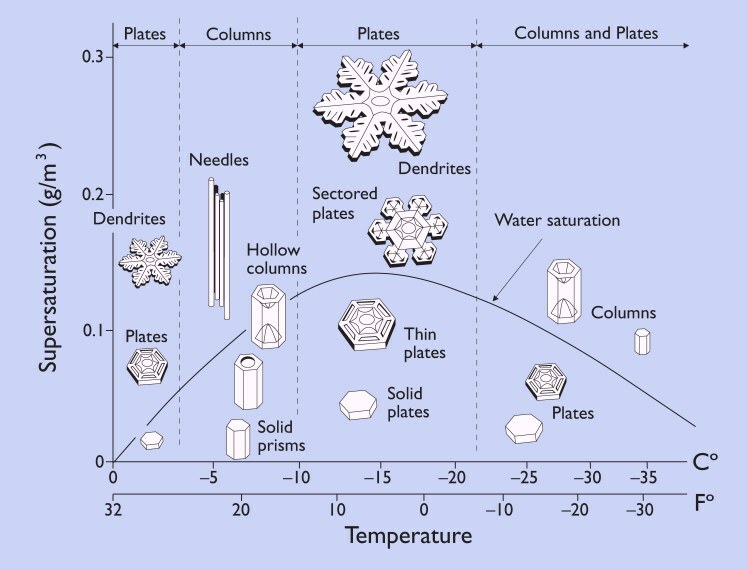 (See Boettner et al, 2000). Maintaining a pesticide-free yard full of native plants and natural spaces is one way to help these amazing creatures. Some people go a step further and raise silk moths to increase their numbers, a labor-intensive and rewarding experience. Join a mothing or insect program at a Mass Audubon wildlife sanctuary near you. 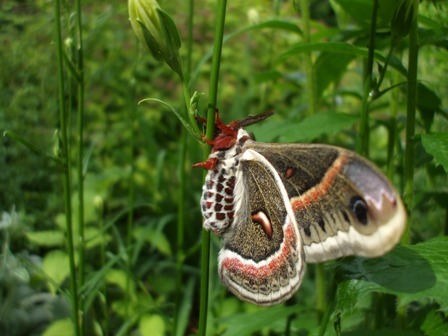 This entry was posted in Nature Notes and tagged moths on July 31, 2013 by Kristin. Every year I wait eagerly to see my first butterfly of spring. Most likely, it will be a mourning cloak (Nymphalis antiopa), a large butterfly with velvety brown wings and yellowish white wing edges. This beautiful “harbinger of spring” emerges on the first warm days, often before all the snow has melted. Myth 1: Butterflies die or head south for the winter. Mourning cloak adults hibernate through the New England winter. Relying on “antifreeze” chemicals in their blood, mourning cloaks spend the winter in a sheltered place, such as in rock crevices, under bark, or in a woodpile. They emerge on warm days, sometimes as early as February, and treat us to visions of spring with their graceful flight. Other overwintering butterflies in New England to watch for include eastern commas, question marks, and compton tortoiseshells. Myth 2: Adult butterflies only live for a few days. Due to their overwintering strategy, mourning cloaks can have a lifespan of over 10 months. One of our longest-lived butterflies, mourning cloaks have been seen in flight in Massachusetts during every month of the year. Myth 3: Butterflies nectar on flowers. There are no blooming flowers in early spring when mourning cloaks emerge, so how do they feed? Mostly on tree sap, particularly from oaks. Mourning cloaks will also feed—brace yourself—on animal droppings and decaying things. Occasionally, if I have been hiking hard, a mourning cloak will land on my hand or head, attracted by the minerals in human sweat. So, on the first warm day head toward a sun-dappled opening in the woods, preferably with storm-damaged trees and broken branches dripping sap, and wait for this resilient insect to make its appearance. Like you, it has managed to survive another New England winter. 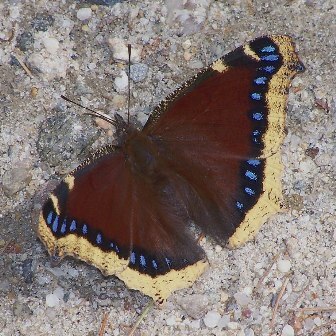 To learn more about the mourning cloak and other butterflies of Massachusetts, check out Mass Audubon’s Butterfly Atlas. This entry was posted in Nature Notes and tagged butterflies, butterfly, spring on April 2, 2013 by Kristin. 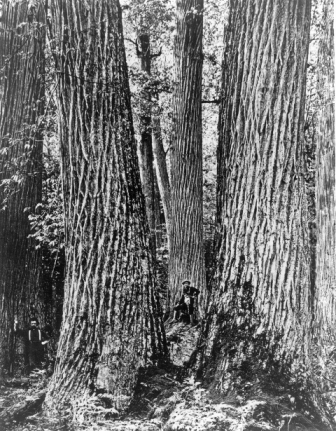 Once upon a time, the American chestnut was king. Some 100 years ago, this tree dominated the eastern forest from Maine to Georgia. It was the most numerous tree in the forest (one of every four hardwood trees was a chestnut). 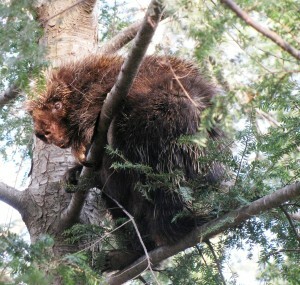 It was the biggest tree, sporting massive trunks up to 10 feet in diameter and reaching 100 feet high. And it was the most important tree, supporting every material need of humans and wildlife. “At last when the tree can serve us no longer in any other way it forms the basic wood onto which oak and other woods are veneered to make our coffins,” said forester, P.L. Buttrick, in 1915 (Mighty Giants, p.67). The American chestnut exemplified the cradle-to-grave concept, literally. So what makes this tree so useful? Its wood—strong, straight, and resistant to decay—was used to build everything from homes to furniture to fences, railroad ties, and barrels. Its tannin was extracted and used in the manufacture of leather and the dying of silk. Its blossoms, beloved by bees, produced the sweetest honey. Its highly nutritious and abundant nuts provided food for wildlife and people. Squirrels, bear, turkeys, and deer relied on nuts for food, and rural economies depended upon the nuts for fattening pigs, feeding families, and earning cash. Today, you can still find chestnut trees in your local woods, but they are usually stumpy sprouts that rarely reach more than 10-20 feet high before succumbing to the blight. The roots of the tree continue to live and send out sprouts, but the tree will never grow tall and majestic like its ancestors. Thankfully, there is hope for the American chestnut. Last spring, Mass Audubon’s Wachusett Meadow Wildlife Sanctuary became a demonstration site for The American Chestnut Foundation’s (TACF) efforts to restore the American chestnut tree to our eastern woodlands. By backcrossing the American chestnut with Asian chestnuts (which are naturally immune to the blight), the goal is to create an American chestnut that is blight-resistant but almost completely American, with all the strong qualities of the majestic trees of a century ago. Wachusett Meadow’s demonstration orchard hosts five young seedlings, several generations into the breeding program. These five seedlings may not hold the key to the future in their DNA, but their presence will raise public awareness about the American chestnut and restoration efforts. Come see for yourself: An interpretative sign at the start of the South Meadow Trail points the way! Want to learn more about the American chestnut? Visit the demonstration orchard at Wachusett Meadow Wildlife Sanctuary in Princeton. Check out The American Chestnut Foundation to find an orchard near you. Read Mighty Giants: An American Chestnut Anthology edited by Chris Bolgiano or American Chestnut: The Life, Death, and Rebirth of a Perfect Tree by Susan Freinkel. This entry was posted in Project Updates, Wildlife Sanctuaries on December 12, 2012 by Kristin. Fall is a time for nuts and no nut is more noticeable than the acorn, the fruit of oak trees and food of wildlife. Some years are boom years for acorns. Hikers dodge falling acorns and balance on trails that seem to be covered in marbles. Other years, we seem to have no nuts. Like many trees, oaks have irregular cycles of boom and bust. 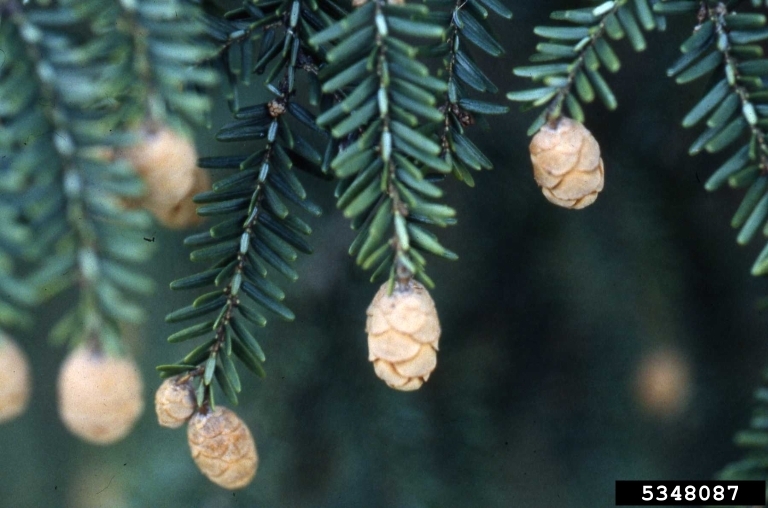 Boom times, called “mast years,” occur every 2-5 years, with few acorns in between. 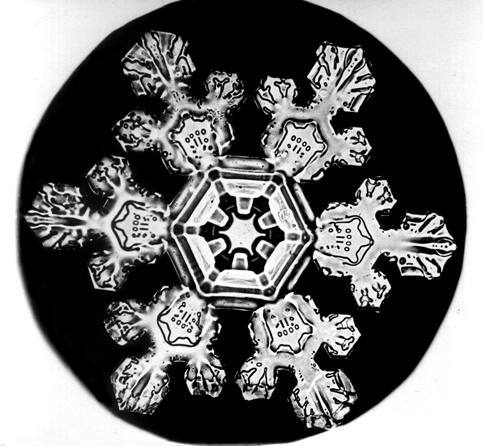 But the why and how of these cycles are still one of the great mysteries of science. Scientific research can tell us what a mast year is not. A mast year is not a predictor of a severe winter. Unfortunately, plants and animals are no better at predicting the future than we are. Strangely, mast years are not simply resource-driven. Sure, a wet, cool spring can affect pollination and a hot, dry summer can affect acorn maturation. But annual rainfall and temperature fluctuations are much smaller in magnitude than acorn crop sizes. In other words, weather variables cannot account for the excessive, over-the-top, nutty production of acorns in a mast year. So what does trigger a mast year? Scientists have proposed a range of explanations—from environmental triggers to chemical signaling to pollen availability—but our understanding is hazy and the fact is that we simply don’t know yet. Boom and bust cycles of acorn production do have an evolutionary benefit for oak trees through “predator satiation.” The idea goes like this: in a mast year, predators (chipmunks, squirrels, turkeys, blue jays, deer, bear, etc.) can’t eat all the acorns, leaving some nuts for growing into future oak trees. Years of lean acorn production keep predator populations low, so there are fewer animals to eat all the seeds in a mast year. Ultimately, a higher proportion of nuts overall escape the jaws of hungry animals. Whatever the reasons and mechanisms behind acorn cycles, mast years do have ecological consequences for years to come. More acorns, for example, may mean more deer and mice. Unhappily, more deer and mice may mean more ticks and, possibly, more incidences of Lyme disease. Many animals depend upon the highly-nutritious acorn for survival. Oak trees, meanwhile, depend upon boom and bust cycles, and a few uneaten acorns, for theirs. There are about 90 species of oaks in North America. All oaks have acorns. There is no such thing as an Acorn Tree. Acorns belonging to trees in the Red Oak group take two growing seasons to mature; acorns in the White Oak group mature in one season. Oak trees have greenish, inconspicuous female flowers and are wind pollinated. Oak trees of North American annually produce more nuts than all the region’s other nut trees together, wild and cultivated. One huge oak can drop up to 10,000 acorns in a mast year! Masting takes a lot of energy! Oak trees grow slowly in a mast year and grow well the year after. 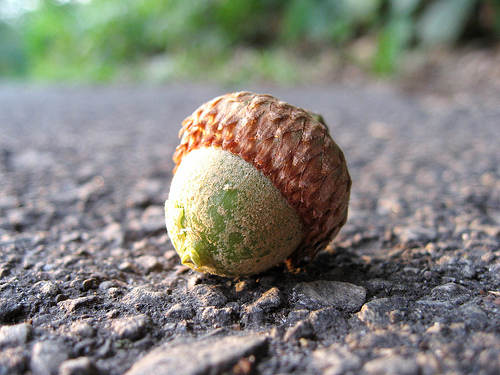 This entry was posted in Nature Notes and tagged acorns, nuts, oak on October 16, 2012 by Kristin. I blame it on the butterflies. 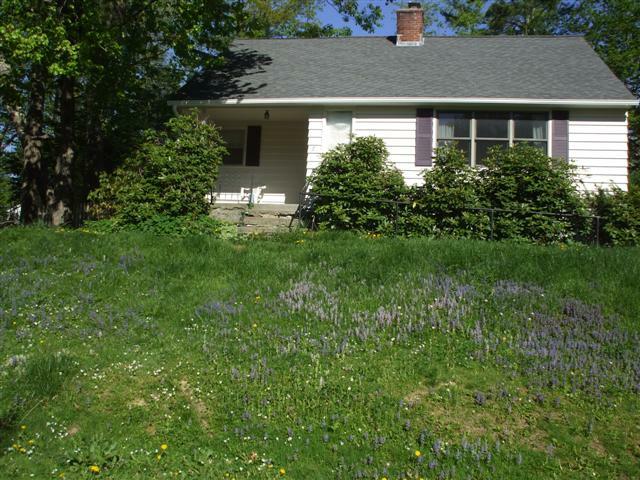 We used to dutifully mow our little lawn in a suburban neighborhood where neat, clean landscapes are highly valued. Then I fell in love with butterflies and everything changed. It started with the gorgeous orange and black butterflies that float in my butterfly garden and nectar on my butterfly bush. Great Spangled Fritillary caterpillars spend the winter in leaf litter and then crawl to the nearest patch of wild violets in spring to munch their way to adulthood. So, we stopped raking out the dead grass for fear of disturbing the fritillary caterpillars. And we mowed around our patches of violets. Then I noticed that the earliest spring butterflies (Clouded Sulphurs, Red Admirals, and Spring Azures) were drawn to the nectar of the early spring wildflowers (dandelions, ajuga, violets, clover, and Robin’s plantain) blooming naturally in my yard. I forbid my husband to mow the lawn until the very last wildflowers had finished blooming and gone to seed. Even then, when the yard was knee high and shockingly messy, I considered that my beloved lemon-yellow Clouded Sulphur butterflies lay their eggs on the tiny clover plants that dot my yard and the caterpillars depend upon their hostplant throughout the summer. Could we mow at all? And so it progressed until our yard was alive with insects and I began to see a lawn as the most sterile spot on earth. Imagine what could happen if every lawn, in every town in Massachusetts, became a haven for butterflies, birds, and other wildlife? 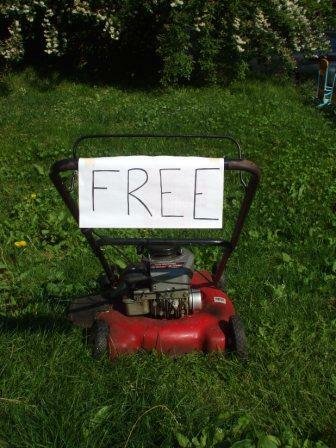 There are all sorts of good reasons to mow a lawn: space for children to toss a ball, cookouts and picnics, the enjoyment of yard work, fear of ticks and poison ivy, and so on. But if we’re just mowing our lawns because we’re supposed to, maybe it’s time to rethink. How about you? Would you give up mowing your lawn to create habitat for butterflies and other creatures? Could you tolerate neighbors who do? This entry was posted in Going Green on September 4, 2012 by Kristin.